Melbourne-UK company Doppelgangster-MKA twists Bertolt Brecht’s 1940 script Mr Puntila And His Man Mattiinto a chaotically funny exploration of capitalist and theatrical value systems. Brecht’s story, which he conceived with Finnish playwright Hella Woulijoki while in exile, is that of the mercurial drunkard and landowner Puntila, his daughter Eva, and long-suffering manservant Matti. Adaptor-director Tobias Manderson-Galvin’s treatment shreds it into a post-theatrical mash-up of iPhone-enhanced performance, song (OK, one song), bravura ranting and audience interaction. 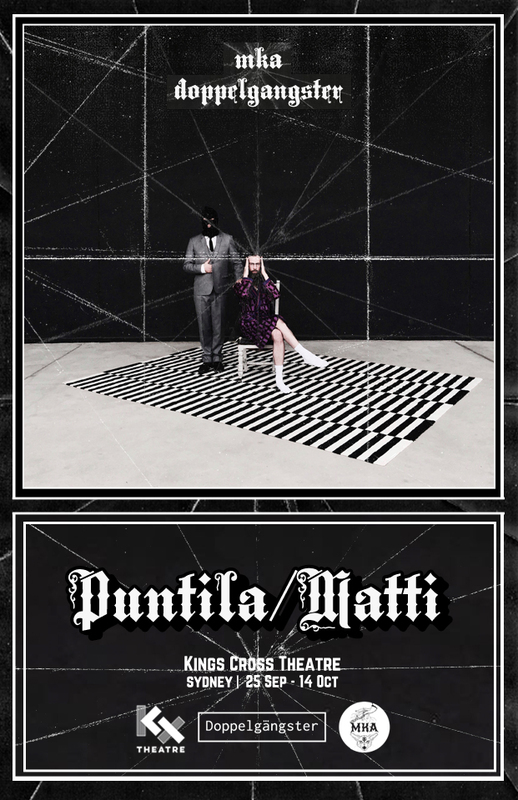 Puntila/Matti sits at the hairy-chested end of the experimental theatre spectrum, focused as it is on the prodigiously energetic Manderson-Galvin, whose catheter-wearing Puntila is the driving force. Combining elements of crackpot, carnival barker and pugilist, it’s a rousing turn. But there isn’t much space left for co-performer Grace Lauer’s underwear-clad Matti, or for Antoinette Barboutis, who occupies the performed/actual role of befuddled stage manager, intoning scene titles into a microphone offstage and running errands as required. Puntila/Matti seems off-the-cuff though I’d venture the chaos created on stage is a lot more considered and repeatable than it appears to be. There are times when it is incomprehensible but the show is never less than viscerally engaging, particularly if you are one of the four selected to serve as Puntila’s fiancées. It’s not often you see a production as equally dedicated to entertainment as it is to subversion.